Now through February 15, 2019 we are committed to matching up to $10,000 of your contributions to support those affected by the wildfires in 2018. You can learn more in the following message from our President, Robert Cohan that was released today. I hope 2019 brings health, happiness, and prosperity to you and your family. With the recent torrential rains, I am reminded of the many people who are still affected by the tragic wildfires that devastated California and the aftermath that will continue to impact our communities for months and years to come. Now flooding, erosion, and landslides are adding to the damage and hindering recovery efforts. We at Carlyle Financial feel compelled to keep helping the people of our state rebuild. That’s why we are reaching out to YOU — our clients, partners, families, and friends who continue to trust us with their biggest investments. We ask you to join us today as we contribute to the California Wildfire Relief Fund. The 2018 wildfire season was one of the worst on record, burning hundreds of thousands of acres and disrupting communities throughout Southern and Northern California. 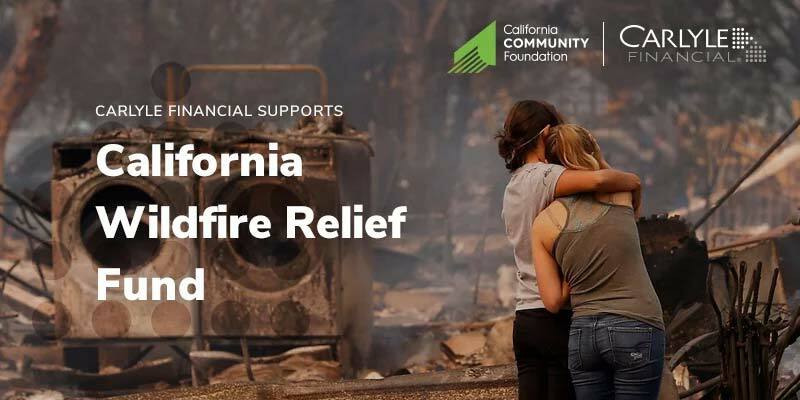 Since the Wildfire Relief Fund opened in 2003 they have granted more than $6 million to Californians to support relief and recovery efforts in the aftermath of devastating California wildfires. You can learn more about the fund and its mission below and you can donate to support wildfire relief now. We are incredibly thankful for your business and are excited to support the California Wildfire Relief Fund with your help! Our team is committed to rebuilding California and we’re looking forward to matching your total contributions up to $10,000, now through February 15, 2019. In Los Angeles and Ventura Counties, the Hill and Woolsey fires set more than 102,000 acres ablaze, killing three, destroying 1,500 structures and forcing close to 300,000 from their homes as mandatory evacuations were declared from Malibu to Simi Valley. In Butte County, the Camp Fire has been declared the most destructive fire in California history. It burned more than 153,000 acres, killing 85 and destroying more than 18,000 structures. The immediate needs of those affected by the wildfires are great, and the recovery process will be long and difficult for communities throughout the state. We’ve chosen to contribute to the California Wildfire Relief Fund because of its deep rooted commitment to our community. The fund is part of the California Community Foundation and directly benefits those who were displaced or lost housing, belongings, or employment, or suffered physical or mental health problems. Learn more about the fund and its mission. Carlyle Financial is matching up to $10,000 of your contributions through February 15, 2019 using this link. To help us manage your contributions, and provide you with a tax-exempt notice, we’re using Crowdrise. Crowdrise is the leading fundraising website system for charitable organization and is preferred by Fortune 500 companies and the American Red Cross, CNN, and Allstate Insurance just to name a few.